Triflin’ Away The Sad Winter Days. Like, With An Actual Trifle. HOOOOO BOY am I exhausted. I realize this is a champagne problem, but I am so damn bored with life. The perpetually gray skies, the bitter cold, the same too-loud conductor on the same too-loud F train, the same mind-numbingly awful sounds of Kenny G coming from some mysterious black hole in my office that, try as I might, I cannot seem to find or drown out with the soothing sounds of ANYTHING ELSE. I just can’t anymore. *Almost all of this sentence has been exaggerated. Surprisingly, exactly none of the sentence about the dollar store has been embellished at all. So I guess that was my long-winded way of telling you all to please not dare me to do anything creepy or crazy or dangerous or alcohol-related (mostly because I’ll probably just accept a booze-related challenge). Instead, I’d love some suggestions on how to not feel so…blah. I’m sure the never-ending winter is a huge contributor to my blues, which is why I’ve started trying to psych myself out with spring-like desserts. Enter the trifle: an easy, delicious confection that, if done correctly, can look like the most delicious cross-section of the earth’s core that could possible exist. Basically, it’s a dessert that consists of even layers of every dessert thing you love so much. This time around, I took it easy and went with a simple lemon curd trifle, but just. you. wait. for what I’m planning. Let’s start with the curd. 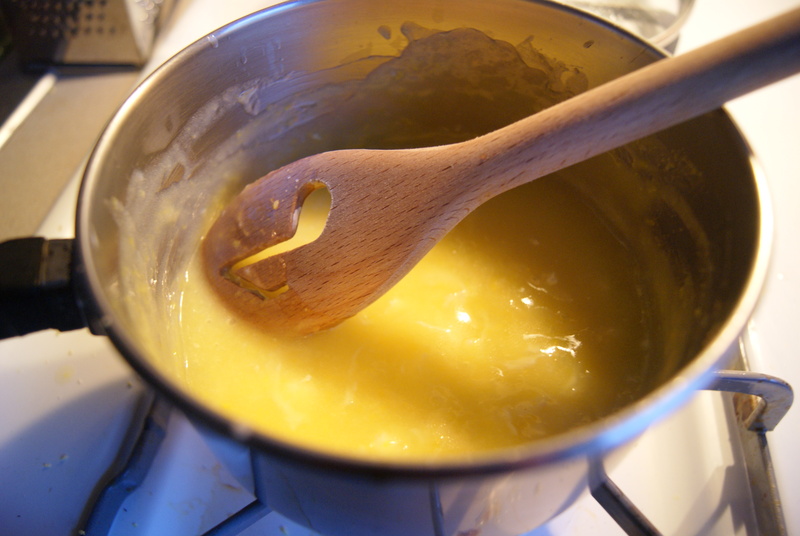 In a medium-sized saucepan, whisk together sugar, lemon zest and lemon juice. Stir in your butter and egg, and place over medium heat. Stir the mixture frequently until it thickens and coats the back of a spoon. Immediately pour curd into an airtight container and refrigerate until cool. For the whipped cream, pour heavy cream and sugar into a clean bowl. With mixer on high, beat cream until peaks begin to form. Add vanilla and whip until completely mixed in. Refrigerate until it’s time to build this thing. And now…to build this thing. 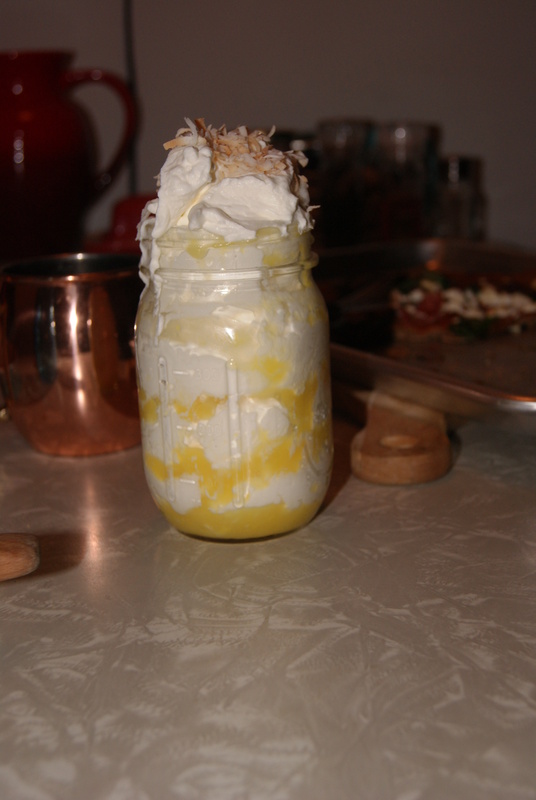 Guys, it’s really kind of difficult to master layering curd and cream in a pint jar. Basically, that means that I didn’t even come close to mastering it. 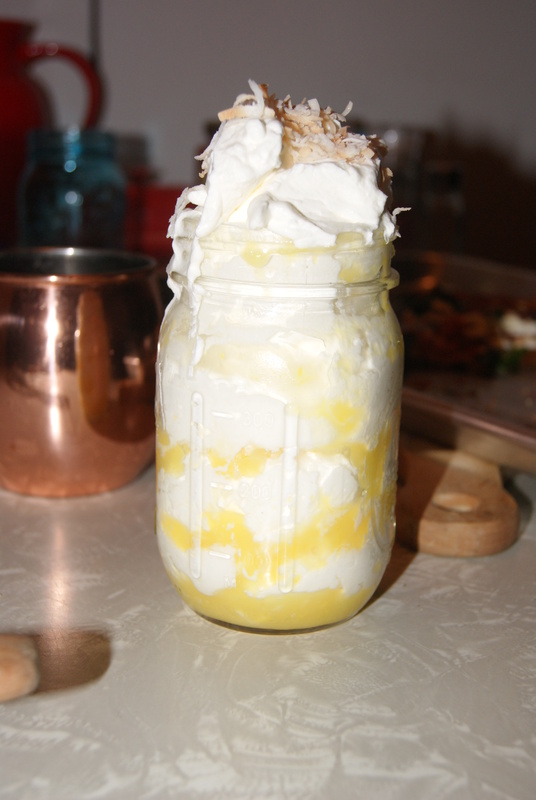 The idea is to layer cream on top of curd, starting with your lemon curd at the bottom of the jar. In between each layer, I sprinkled toasted coconut, then topped it all off with a very, very healthy dollop of whipped cream and even more coconut. My boyfriend specifically requested that the Moscow Mule mug I got him for Christmas be featured in this picture. Also…homemade pizza! So, after about a minute of trying to gracefully dip into this thing with our spoons, my boyfriend and I mutually decided to screw being dainty and mixed this monster right up. The verdict? DUDES, it’s like the best cake filling ever. It’s like the kind of cake filling you ditch the cake part for. SO. WORTH. EVERYTHING.